Regular lemons will work perfectly fine- just add in a bit more sugar and everything will be delicious! **If you can’t find Meyer lemons, regular lemons would do just fine. I’d increase add a few extra tablespoons of sugar into the lemon curd, just to be safe. Place the zest, juice, sugar, salt, and eggs in a metal bowl. Whisk away. Add in the butter, clamp on an instant-read thermometer, and set the bowl over a tiny pot of simmering water. Don’t ever stop whisking gently or you’ll end up with a layer of scrambled eggs on the edge of your bowl. Keep cooking and stirring until it’s thick, and the thermometer reads 160°F, 5-10 minutes. Place a fine-mesh sieve over another metal bowl and press the curd through it with a rubber spatula. Cover the surface of the curd with plastic wrap, cool completely, and refrigerate until ready to use. Mix together flour, milk, butter, yolks, sugar, salt, cinnamon, and yeast mixture in mixer at low speed until a soft dough forms. Increase speed to medium-high and beat 3 minutes more. Heat 2 1/2 inches oil in a deep 4-quart heavy pot until it registers 350°F on thermometer. Fry doughnuts, 3-4 at a time, turning occasionally with a wire or mesh skimmer or a slotted spoon, until puffed and golden brown, about 1-2 minutes per batch. Transfer to paper towels to drain. (Return oil to 350°F between batches.) Let cool. 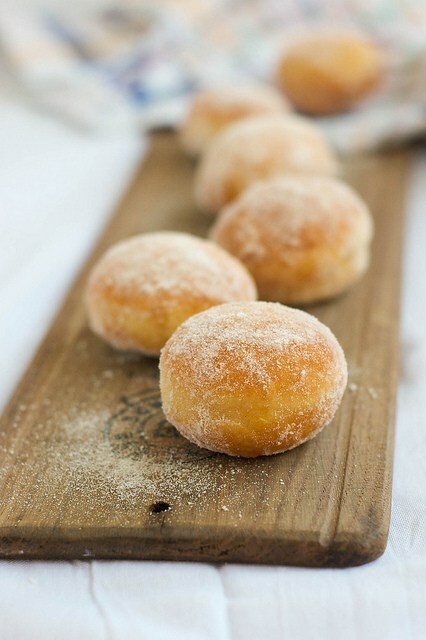 Once the doughnuts are completely cool, get creative to fill them with the lemon curd. I used plastic squeeze bottles with long tips, but a long-tipped pastry bag, mini baster, or flavor injector (food syringe type situation) could work just as well. Alternatively, you could poke a large hole in each doughnut with a skewer and use a small funnel or spoon and steady hand to fill the doughnuts. There are about a million ways to go about this, so use your imagination! When the doughnuts are filled, roll them liberally in granulated sugar (powdered sugar could be delicious, too) and enjoy.